Two British gentlemen go on a camping holiday in the west of Ireland, and exploring the region they are staying in discover a massive pit and, overhanging the edge of it, some crumbling ruins. There they discover the diary left behind by an unnamed recluse, who along with his sister Mary and faithful dog Pepper was among the last residents of the old house, having moved there to try and get away from a great and terrible grief. 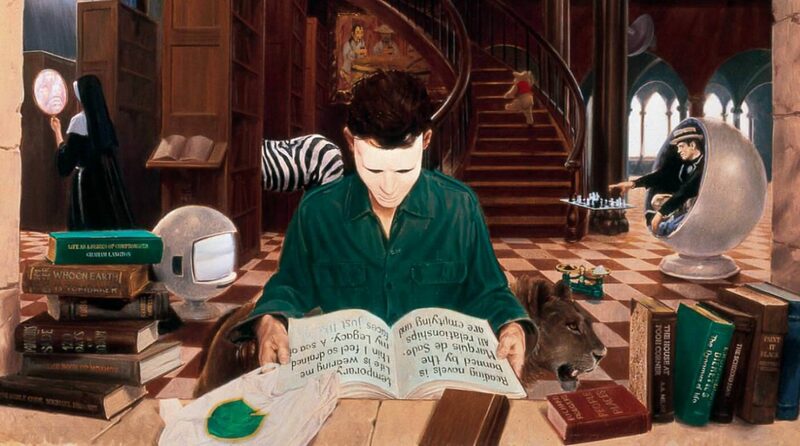 However, it transpires that the house is – through whatever means – aligned with other planes and dimensions, whose inhabitants eventually take an interest in the recluse. He is gifted with cosmic visions of other realms of existence, of the fate of the Solar System and the grand Central Suns about which all others orbit, of the Sea of Sleep where even his dead love can be found… but he’s been noticed. 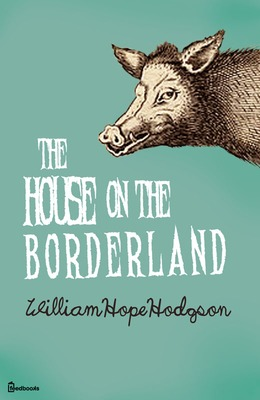 At first the outside influences take the form of an attack on the house of a horde of humanoid pig monsters that are not unfamiliar from subsequent stories by William Hope Hodgson, but more subtle dangers soon also threaten. It’s the piggies people largely remember about The House On the Borderland, largely because they occupy by far the most conventional stretch of the narrative, the good old “besieged by ravening savages” adventure story trope rendered less problematic by said savages being alien avatars of ultimate cosmic evil instead of cartoon caricatures of human beings. Even then, though, there’s much more going on than meets the eye; as well as strange subterranean activities that for the most part we never get a good glimpse of, Mary behaves really quite strangely during the attacks. Longtime Ferretbrain readers may remember that a while back I moaned about how the horror genre is in the doldrums, and that a good first step towards reviving it would be for someone to produce a “Horror Masterworks” series, along the lines of similar series in the crime, fantasy, and SF genres: a series of reprints of important horror novels and short story collections, in an easily-recognised format, to act as a roadmap to help people who haven’t been keeping up with the genre avoid the dross and find the gold. Finally, someone’s started something along these lines, and to my surprise it’s Wordsworth Editions, known mainly for their super-cut-price reprints of books whose copyright has expired. Their Tales of Mystery and the Supernatural, curated by David Stuart Davies, consists mainly of reprints of both the 19th Century fiction in which the genre has its roots and the early 20th Century stories which gave the genre its current shape – although there are a few original books, such as Davies’ own Sherlock Holmes and the Hentzau Affair. The first book I’ve picked up from this selection is The Casebook of Carnacki – Ghost Finder, a reprint of a classic selection of nine stories by William Hope Hodgson first published by Arkham House in 1947. 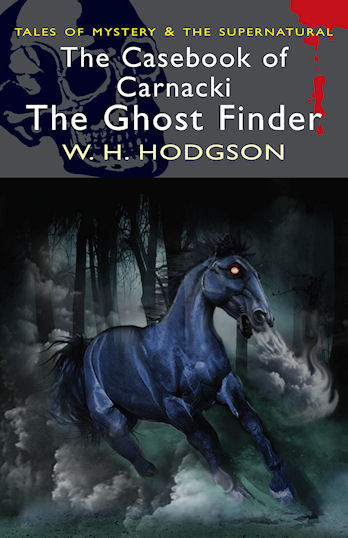 It includes the six stories in the Carnacki the Ghost Finder series that Hodgson published in his lifetime, as well as three stories that were only released posthumously. The stories follow the investigations of Thomas Carnacki, an Edwardian psychic detective, who uses both scientific techniques and occult experiments to ascertain the truth behind apparent hauntings. Carnacki is an odd mix of sceptic and believer, entirely willing to accept both natural and supernatural explanations for events: since the mysteries in his cases sometimes turn out to be entirely natural (one of the stories in the collection is in fact a straight detective story, with not even the slightest suggestion that a ghost is involved at any point), sometimes entirely supernatural, and sometimes a mix of the two, this attitude is entirely justified. Incidentally, this is a great way to keep the reader guessing: too often which “psychic detective” stories the cases all turn out to be either always genuine incidents of the supernatural (such as in the John Silence stories of Algernon Blackwood), or always man-made hoaxes (as in Scooby-Doo), which leads to a kind of predictability that Hodgson avoids.